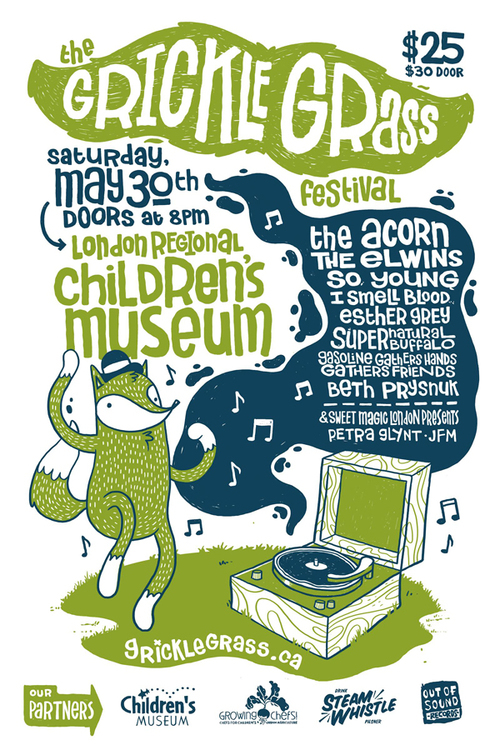 This coming Saturday, May 30 is the 6th annual Grickle Grass Festival at the London Children’s Museum. In partnership with Growing Chefs! Ontario, this event is part fundraiser, part family day of fun! 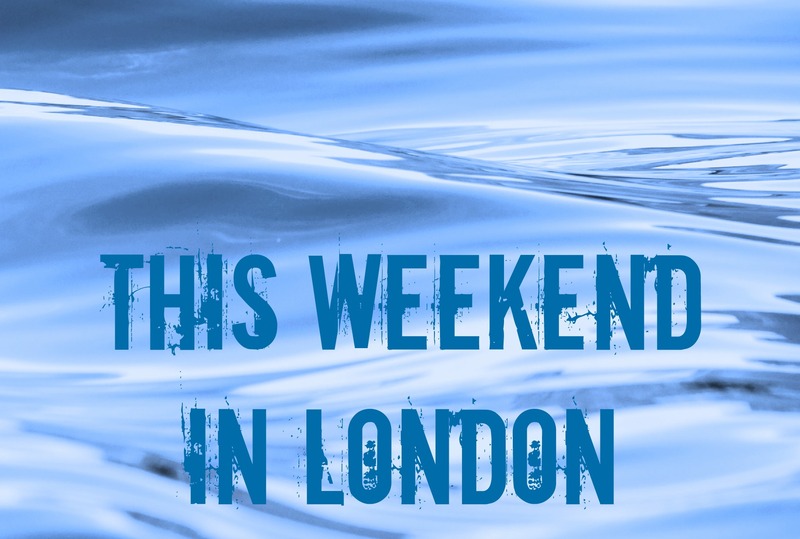 Are you interested in sustainable living, healthy living, art and music? This is your event. From 10:00am to 5:00pm the London Children’s Museum will be taken over, both inside and outside, for the festival. It will be a full day celebration of learning, focusing on sustainable living, healthy choices, environmentally friendly food and where it comes from, the importance of fitness, and taking care of the world around them. Bring the whole family for button making, garden planting, dance partying, cooking demos, and so much more! ADMISSION is the regular Children’s Museum admission of $7 per person, $2 for babies 12-23 months. In the evening, the museum turns into a fully licensed music venue for the adults. Every floor of the museum will be filled with music and art for you to enjoy at your leisure. The evening event is a fundraiser for the daytime programming. ADMISSION tickets are $25 in advance or $30 at the door. For advanced tickets, purchase HERE. If you’re interested in a really simple and fun way to get your children interested in growing their own food, try some sweet potato slips! Unlike most vegetables, sweet potatoes are not grown from seeds, but are grown from other sweet potatoes. You know when you leave a sweet potato in your pantry a little too long and it starts to grow legs and attempt to crawl away? That’s all part of the magic! Head out to the market or grocery store and select a nice looking sweet potato (or many!). Get a large mouth transparent jar and fill it with water. Insert 3-4 toothpicks about midway down the sweet potato and slowly lower it into the jar, having it suspend itself with the toothpicks (see the picture above). Place your jar in a warm window or under a warm light. Your sweet potato will begin to grow roots and sprout leaves! Kids will love being able to see the roots grow down and the stems reaching up for sunlight. When the weather is warm (i.e. June or July), you can carefully separate the slips from the original potato and plant them in containers or in your garden. They will need deep, loose soil and plenty of water to grow. 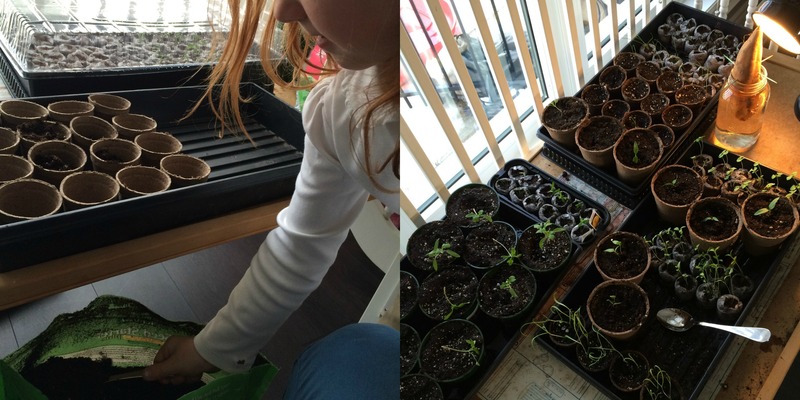 This is the time of year when Ontarians start to plan their vegetable gardens and start seeds indoors. Whether you are a seasoned gardener or have never touched a pot of dirt in your life, gardening is possible! What’s more, it’s a great way to encourage children to learn about where their food comes from and grow some for themselves. Sharing this experience with your little ones may even get them more interested in trying some new foods, so give it a shot! After all, as moms, we know it’s a pretty incredible feeling to grow something beautiful. Herbs – they grow easily and can be used frequently. Kids can pick leaves and eat them anytime they like. Choose ones you’ll actually use! Basil, oregano, cilantro, mint, chives, etc. Cherry Tomatoes – another one they can grab off the plant and snack on while they’re outside playing. Make sure they’re old enough to not choke! Pumpkins – how much fun would it be to grow your own Halloween pumpkin or Thanksgiving pumpkin pie pumpkin? Kids will love to watch how big these can grow! Make sure you have a lot of space, these guys like to spread! Radishes – if your kid happens to like these odd little root vegetables, then this is a definite for planting. They grow quickly and are harvested early in the season for quick gratification! Carrots – carrots are a classic with kids. It is often one of the rare veggies that kids will eat and they’re fairly easy to grow in the ground or in deep containers. Part of the fun in growing your own is seeing all of the funny shapes they come in when you pull them up – they aren’t all perfect like at the grocery store! For bonus fun, plant rainbow carrots and do a little research as to why we mostly eat orange carrots now. Bush Beans – you won’t have to worry about planting these beans near something they can grow up and they’ll be easy for little hands to reach in and pick. Fresh beans from the garden are hard for anyone to resist! 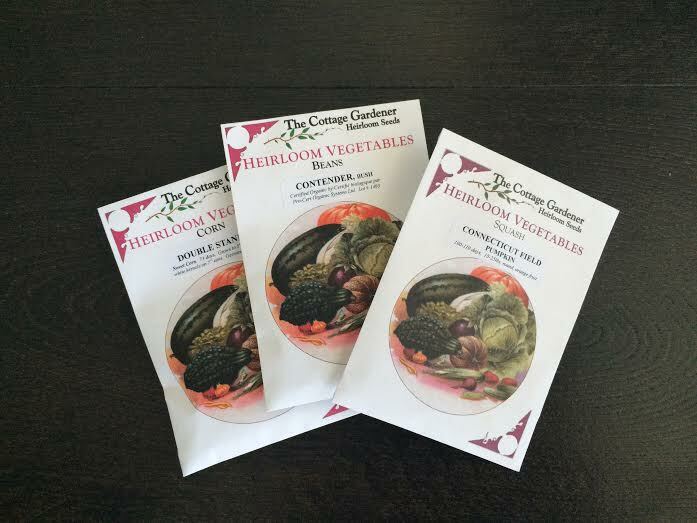 Seed packets will come with instructions as to whether you should start seeds indoors or plant them directly into the garden. If you are going to start your own seeds, start now! Head to your nearest garden centre with the kids and have someone there instruct you on the best way to get them started with potting soil and starter pots. 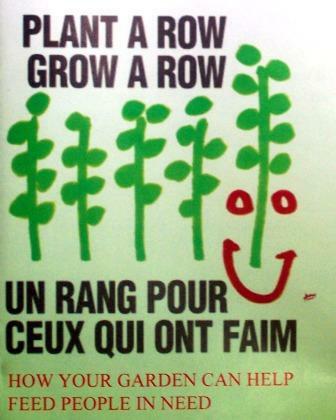 Another option is to have someone else (a nursery) start your seeds for you and buy seedlings (small plants ready to plant in the ground) later in the spring. Planting directly into the ground happens anytime from now through summer, depending on the seeds/seedlings. If the instructions say ‘after last frost’ then you have to wait until the end of May to be safe. Water your seeds regularly and wait for the magic to happen!